OMG Posters! 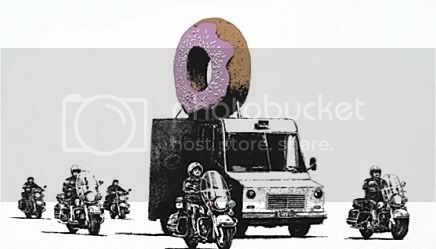 » Archive "Donuts" Art Print by Banksy (Lottery Info) - OMG Posters! Hey crazy Banksy fans, Pictures on Walls has a new print available, but they are doing things a little differently this time. “Donuts” is a 22″ x 30″ screenprint. It comes in Strawberry or Chocolate, each with an edition of 299. The price of the prints will be £465 each. If you’d like to purchase one, you’ll have to enter the lottery (it ends at 12pm tomorrow, London time). Visit PicturesonWalls.com. i entered 8 times and didnt win – using different ip addresses and email accounts! also once the pic on walls staff & friends & circle of banksy “friends” reserve theirs 299 will become 100! noticed on ebay 2 people already selling theirs! – they shouldb’t be allowed them! hope we can work something out…would love this print. JSC – I’ll buy that from ya, plus 200 for your trouble? Plus some other prints. Chill out mah dude… get off the dudes jock. ha… in ya face beggars! Eh, enjoy it to anyone that got it. I would have sold it the minute I got it. Who cares if you own a Bansky print? They wont be worth much sooner than later. Whoop whoop! Just scored it on the “second chance” e-mail today! Glad some people turned it down!! i missed out on this print and decided to swallow the costs and buy from an ebay seller. 1500 it set me back – im gutted but just love this print. i got it in chocolate, if anyone wants to sell their strawberry drop me an email. However i cant afford another 1500. 1200 max via paypal. Hopefully in the years to come this 1500 giant hole in my pocket will have been a sound investment.